When buying coffee makers for home we like to buy appliances with good quality, manufactured by well-known manufacturers and with a familiar brand name. That is how we came to an idea to write about coffee makers made in Germany. From those expensive ones to those with reasonable price, we selected only the best ones for you. As a country with high marks in the production of appliances of any kind, German products are highly evaluated. The price always comes along with the quality, but we like to say „we are not that rich, to buy cheap coffee makers“. It is better to buy one good and long-lasting coffee machine than something with poor quality. 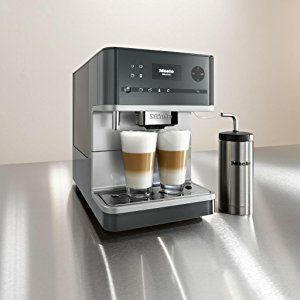 In this list below, you will find different German made coffee machines with different characteristics, from programmable to simple ones, but we are sure you will find something that fulfills your needs when it comes to quality. We are starting with the most expensive one in this list. It is described as a Countertop Coffee System because of everything that it offers. With a control touch screen at the frontal side of a machine, you can completely customize your drink. It has a four user profiles and a possibility to make two drinks at once with just one touch. This is a machine with a great choice of drinks like coffee, espresso, latte macchiato, cappuccino and cafe latte, and you can choose between single or double shots. The CM6310 Countertop Coffee System is equipped with hot water spout and a milk frother. It has a warm plate for cups to be warmed up before use. Once the machine is warmed up it takes only one minute to get a tasteful coffee. Dimensions for this coffee machine are 10″ wide, 16,5″ deep, 14″ high, and as you can see it is not that small but its options are great and it’s worth to spend a little more space on your kitchen counter for this. CM6310 can use both, ground and whole bean coffee, there is a separate chute for ground coffee. This coffee machine is produced in two color variations, black/silver, and white, but we are sure that one of these two will perfectly fit into your kitchen design. Miele CM6 Countertop Coffee System is made in Germany and Switzerland. If you looking for great superautomatic coffee machine CM6310 Miele Counter top Coffee Systems is best choice especially if you are demanding in terms of high health and quality standards that every product made in German must have. 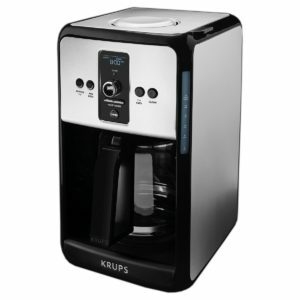 We already wrote about Krups coffee makers before, but we probably never mention that it is a German company. 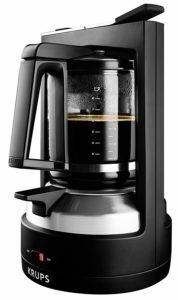 This particular model is 12-cup coffee maker with the glass carafe but also with the option for 1-4 cups so you don’t have to make 12 cups every time. KRUPS Turbo Savoy EC411050 is a programmable coffee machine with many options, a timer for brew delay, coffee strength with a choice between regular and bold, you can set temperature, choose small batch and you have an auto-clean option. This model has a reusable gold-tone filter but you can use paper filters as well. 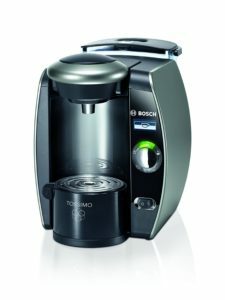 It also has a „ turbo“ option which speeds up brew cycle up to 35 percent. Its dimensions are 12.2 x 9.6 x 15.9 inches, and it is a little bigger since it is a coffee machine with carafe. What is different with this model is that it has a water reservoir’s window placed on the front side of a machine so you can track the amount of water easily. This is a quiet machine with a sound alert when the brew cycle is finished. KRUPS Turbo Savoy EC411050 has an auto shut-off where you can set the time when you want your machine to turn off. Convenience, isn’t it? Something completely different from everything on this list. Very simple coffee maker with a unique way of coffee preparation. It only has an on/off button. It uses steam extraction method when brewing, and it is created for a 10-cup carafe. Its water reservoir and heating system are made of stainless steel and it is equipped with a permanent gold-tone filter. To get a fresh and tasteful cup of coffee, the only things you need to do are to fill the water tank with water, put coffee in the filter, place the carafe on top and switch the on button. It prepares coffee at 187 degrees, but this coffee maker doesn’t have a hot-plate and the coffee will start to cool down 15 minutes after preparation. It actually has one option and that is an automatic shut-off 20 minutes after brew cycle is over. The good side of this coffee maker is that you can decide how much coffee you want to brew as long as it is under 10 cups, and it takes only 5-8 minutes to brew the whole 10-cup carafe. Its water tank is 32 oz capacity and the total dimensions of the coffee machine are 9.7 x 9 x 13.8 inches. If you like your coffee quick and without fuss then this is one for you. 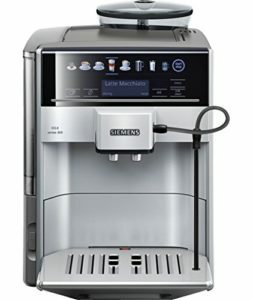 Although it is a single serve coffee maker, this machine is actually big and its dimensions are 10.39 x 14.57 x 12.36 inches. It is true that it will take a little more from your kitchen counter but it will repay you with a perfect cup of coffee every time you turn it on. This single serve brewer is made in German and uses only T-discs and its savvy TASSIMO barcode system will scan every disc you put in it. You can find it inconvenient, but you can find T-discs in different flavors and one of them must suit your taste. Every T-disc has a different bar-code. After machine recognize bar –code, it is preparing drink in a right way. You can easily customize your drink with just one touch, from temperature, through the strength, water amount or time preparation. You will get your coffee really quick in the morning since it has an instant heat-up. Another advantage of this coffee machine is the fact that it has a built-in water filter, so the right taste of coffee is guaranteed. Descaling option makes cleaning easy, and 1.8 -liter water thank is enough for several drinks. You can refill it by removing it or while it is still attached to a coffee maker. We can say that this coffee maker is a real jewel on this list. Similar to a previous one, T47 has many good options. However, we will start with the thing it doesn’t have. First, this model doesn’t include a built-in water filter, and you will have to know the quality of a water you use when preparing coffee. On the other side, the machine gives you an information when is the time for cleaning, so you can prevent any malfunction. The way of preparing coffee is completely the same, it uses T-discs and with that, you have a wide range of possibilities in beverage choice, from all sorts of coffee, hot chocolates, tea and cold drinks. It has an instant heat-up for quick drinks which means coffee in just one minute, and the possibility to adjust the cup stand in order to pour your coffee in regular cups or travel mug. T47 is smaller than previous one and with dimensions of 13.25 x 8 x 11 inches, it is a perfect choice for small kitchens. With its noise reduction system, it will not be annoying in the morning when you just want to drink your coffee in silence. Since it gives you an opportunity to use the water filter if you buy it separately, we can say that it is same as the previous one, just a little smaller, which is actually a good characteristic. 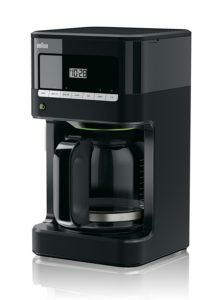 Braun KF7000BK Brew Sense Drip Coffee Maker is a programmable 12-cup coffee maker. Produced by Braun, it guaranties quality, long-lasting usage and full-bodied coffee every time you wish for it. You can set pretty much everything with this little machine. At the front side of this coffee maker you can see a control panel with basic options. Auto ON and auto OFF options gives you possibility to set the time when you want your coffee maker to start with worming up and cooling down after preparation. It is recommended to use shut off after 2 hours, but you can choose other time period as well. Auto clean option makes cleaning easy, and the timer makes mornings perfect with prepared coffee at exact time decided by you 24 hours in advance. 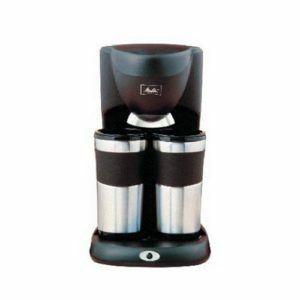 It is a 12-cup coffee maker, but you can make a small batch as well by pressing the 1-4 cup button. Braun KF7000BK has a built-in water filter so the good taste is guarantied when it comes to a water quality. Its anti-drip system makes every stealing of cup during the brew cycle a clean job. Gold-tone filter which is included with this model can be supplemented with cone shaped paper filters as well. We think that we mentioned every good characteristic of this coffee maker, if we left some information behind, you will find it if you choose this coffee machine for your household. Braun is German brand but they also move production in China. Still the Braun coffee machines continue to be of high quality and the production is carried out according to their specifications. Siemens isn’t that well-known for making coffee makers, but we are sure that you have at least one home appliance manufactured by Siemens and that you are satisfied with it. As a machine manufactured by this well-known brand you can assume that its price is a little higher. But it is totally worth of it, if you take in account what this coffee maker can do for you. This is a dream come true for every coffee lover. Its appearance is modern and stylish. At the front side of a machine you can customize your beverage by using fantastic touch-screen. With just one touch you can choose between single or double shot, different beverages, temperature, water amount, milk frother and many other options. When preparing espresso, this devilish coffee maker uses temperature between 194-203° and double grinding in order to accomplish the perfect taste. 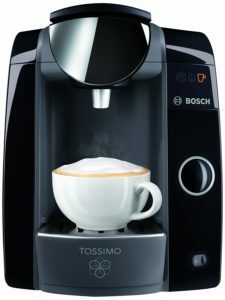 Its built-in intelligent heater guaranties perfect brewing temperature, and 19 bar pressure pump makes every cup tasteful. Another advantage is that you can completely customize your single shots by choosing between five different volume sizes. This coffee maker is big and its dimensions are 15.16 x 11.02 x 18.86 inches, but it is OK to sacrifice a little more of kitchen counter in order to get all this. The milk pumping extension and water filter are included, so all you have to decide, is what kind of coffee is perfect for you, and you can start a day as a real king. You probably didn’t know that the Melitta is a German company. It is well-known for its production of coffee filters and different types of coffee, but they also manufacture interesting coffee makers. For example, we had decided to write about this one because it is created for two travel mugs. It is actually perfect for those who have no time to drink coffee at home but spend a lot of time in driving to work and back. Its water reservoir is prepared to fill two 14 oz travel mugs with hot and tasteful coffee. It is a simple coffee maker, you just need to turn it on to start with brewing. It automatically turns off after preparation. Brew basket is created for cone-shaped paper filters number two. Melitta ME2TMB is made in plastic and stainless steel, and it includes two stainless steel travel mugs which are dishwasher safe. For someone who is always in a hurry, this coffee maker will be his best friend. Germany is a synonym for a quality home appliances. While researching about all the German companies that manufacture coffee machines, we find ourselves surprised with all the coffee maker models and their possibilities. We gave our best to choose only the good one for this review. You will find some of them as a perfect gift for someone, or as a perfect replacement for your old one. Either way, it is time to treat yourself with new German coffee maker from this list. Are we right, or what? I’ve heard from my sister which now lives in Germany, that the country has a good coffee machine though a bit pricey.